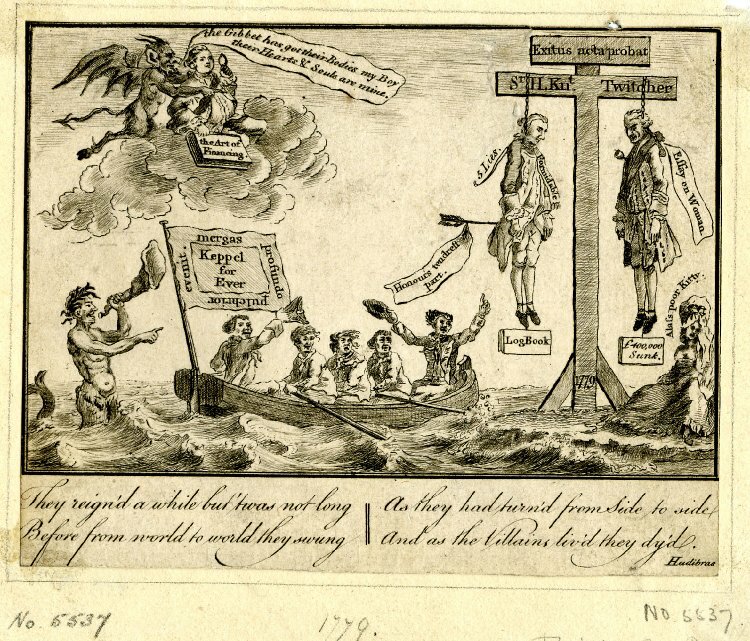 The Fate of Palliser and Sandwich, artist unknown, 1779, British Museum. Lord Sandwich (John Montagu, 4th Earl of Sandwich) is a famously unpopular First Lord of the Admiralty. In fact, he was thrice First Lord, but his first two terms were undistinguished posts coming at the end of major conflicts, and he did nothing particularly noteworthy in either of those. Sandwich was more a statesman than a sailor, he allowed his policies to be influenced by domestic parliamentary concerns, rather than broad strategy. Political infighting was also destined to mar the career of Hugh Palliser, who was accused for failing to engage the enemy at the Battle of Ushant because of his political disagreements with the popular Augustus Keppel. 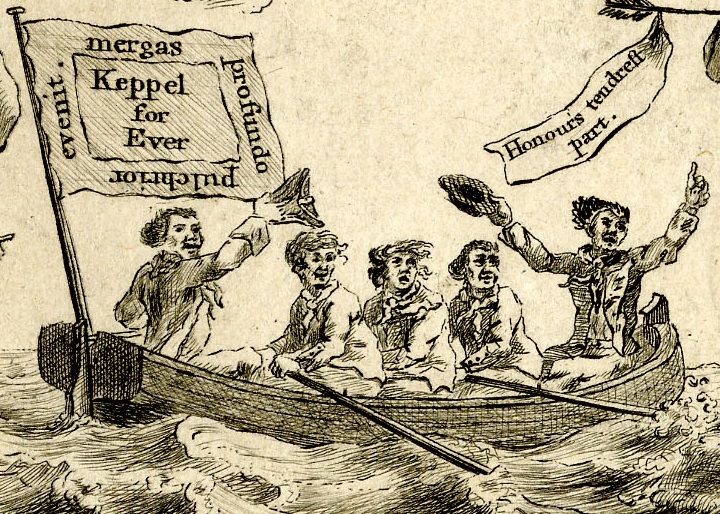 The fallout from the Battle of Ushant drew political battlelines on the homefront of Britain in the American Revolutionary War, and the unknown artist of this piece has clearly taken Keppel's side. 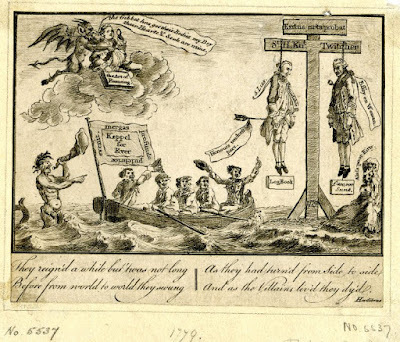 Palliser and Sandwich are hanging from a gallows, and Sandwich's bare breasted mistress sobs beneath his corpse. Afloat, a group of sailors cheer and wave at the bodies, urged on by the horn of Neptune. Around the banner flying at the stern is emblazzoned mergas profundo pulchrior evenit: "The world knows him, and knows nobody else in his place." The oarsmen are all bareheaded, one of whom wears a bob wig. They all wear neckcloths and jackets that end about the top of the thigh. Those jackets that we can see are uniform in that they have scalloped mariners cuffs all of which are buttoned. At the stern is a naval officer with a cocked hat, bob wig, and neckcloth that notably is draped over his back. In the bow, a sailor waves his round hat, and we can clearly see the wide lapels of his double breasted jacket. He also wears no waistcoat, and we can see his shirt tucked into the band of his trousers or petticoat trousers.